BANGKOK, Apr 5, 2018 - (ACN Newswire) - Dusit International, one of Thailand's foremost hotel and property development companies, has introduced ASAI Hotels, a distinctive new brand designed to link curious, millennial-minded travellers with authentic local experiences in vibrant cities and resort destinations worldwide. 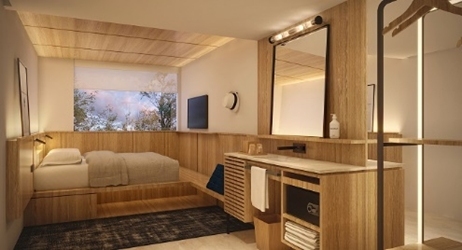 Set to officially launch in Q1 2019 with its first hotel in Bangkok's renowned Chatuchak Market, ASAI Hotels embraces a sustainable, community-focused concept, with each property designed to reflect the culture and heritage of its location through collaborations with local artisans. In line with the four core pillars of the brand - Thoughtful Essentials, Common Areas, Locally Inspired and Connected Community - each hotel will feature compact rooms (approximately 15 sq m), whose contemporary design will emphasize key features like superior quality beds and high pressure rain showers. A large mixed-use space, meanwhile, will include a cosy and efficient work space, a leisure area, and a restaurant concept curated by local chefs who champion sustainability. In the upcoming Chatuchak hotel, which is the only hotel to be located within the world-famous market, this includes an eatery developed by Bangkok-based chefs and restaurateurs, Jarrett Wrisley and Paolo Vitaletti, whose own restaurants, Soul Food Mahanakorn and Appia, are renowned for their sustainable approach to cooking. Their menu at ASAI Chatuchak will highlight produce from Thailand's Royal Projects. ASAI Hotels' management team hopes to secure over 10 properties in the pipeline by the end of the year across Southeast Asia and Japan. This includes owned and joint venture properties as well as properties under Hotel Management Agreements. Australia, Europe and Central America are also on the radar for potential projects. "Inspired by community, and driven by sustainability, ASAI is an exciting new concept for Dusit that will leverage the company's 70 years of hospitality heritage to deliver a new kind of stay experience in vibrant neighbourhoods worldwide," said Mr Siradej Donavanik, Managing Director of Asai Holdings Co., Ltd., Dusit International. "The brand has been carefully crafted to meet the needs of millennial-minded travellers who seek authentic local experiences, and who appreciate value and quality for money. "ASAI is not budget travel - this is an affordable lifestyle brand offering something new, different and bespoke. Our collaborations with local artisans in each destination will ensure each stay is unique, memorable, and definitely worthy of our slogan - Live Local. And everywhere we set foot we will always ensure we have a positive impact." Ms Suphajee Suthumpun, Group CEO, Dusit International, said, "In line with our three-pronged strategy for balance, expansion and diversification, the introduction of ASAI Hotels will add an innovative new revenue stream to our company that complements our traditional hospitality offerings and actively responds to the needs and desires of millennial-minded travellers. "Recent detailed studies in America have shown that, alongside a desire for local experiences, a majority 35% of this segment prefer to stay in luxury and upscale resorts. The majority also placed cost and security as chief concerns when booking accommodation. ASAI is perfectly positioned to meet these needs, and we look forward to making the brand a huge success." Dusit International is currently in a significant growth phase which will see the company's current portfolio of 27 hotels surpass 70 worldwide within the next four years. The company's other hotel brands, which cover luxury and mid-market segments, include: Dusit Thani, Dusit Devarana, Dusit Princess, and dusitD2. Dusit International was founded in 1948 by Honorary Chairperson Thanpuying Chanut Piyaoui, whose first hotel was the Princess on Bangkok's Charoenkrung Road. Today the company is a leader in hotel management and hospitality education and comprises a unique international portfolio of distinctive hotels and resorts operating under four brands: Dusit Thani, dusitD2, Dusit Princess and Dusit Devarana. 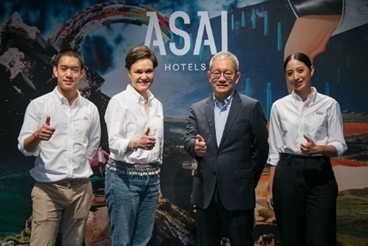 The new ASAI Hotels brand is set to open its first property early next year. The company also operates the signature Devarana Spa and has a fast-growing Education Division. The latter, established in 1993, comprises Dusit Thani College, which offers vocational and postgraduate hospitality degrees at campuses in Bangkok and Pattaya; and Le Cordon Bleu Dusit Culinary School. For more information, please visit www.dusit.com.